I want to use automatic reply rules to forward mail to a colleague when I’m out of the office, but I don’t want to announce to everyone that I’m out. Is there a way to use autoreply rules and not send an out of office to everyone? Yes, but only for internal addresses. If you enable automatic replies but leave the message field blank, the automatic reply rules will run but no reply is sent. Unfortunately, this doesn’t work for external addresses – you’ll need to set a message but can limit automatic replies to Contacts only. This method will also work with Outlook.com accounts. To set up Out of Office, open the Out of Office dialog from the File tab. Select Send Automatic replies. Select the time period it will be in effect, if desired. Click Rules in the lower left corner of the dialog. 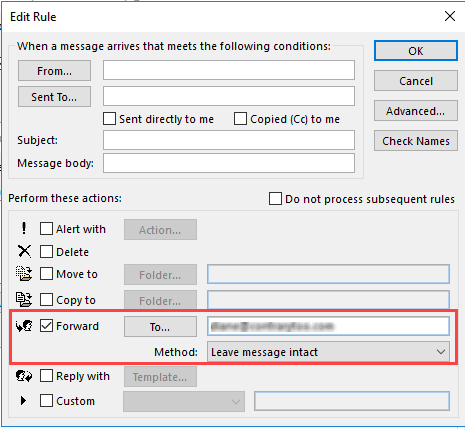 Click Add Rule to create your Out of office rules. To Forward all messages, tick Forward and enter an email address. Choose the forwarding Method. Standard is a normal forward, with the message From you with the forward header in the body, while Insert as attachment does just that. Leave message intact will redirect the message to the address, so it appears to be from the original sender (this looks nicer but could trigger junk mail filters). File > Automatic Replies > Rules... >Add Rule... > Forward > Check the box and populate the "To;" field Using PowerShell, where can I find this "rule?" Already tried: Get-MailboxAutoReplyConfiguration and Get-InboxRule but no luck. It doesn't show as a "rule" in the usual places. Any ideas? As far as I know, setting OOF rules using PowerShell is not possible - its not exposed in PowerShell. That sets OOF, but not the OOF rules.